Click for high res. image. 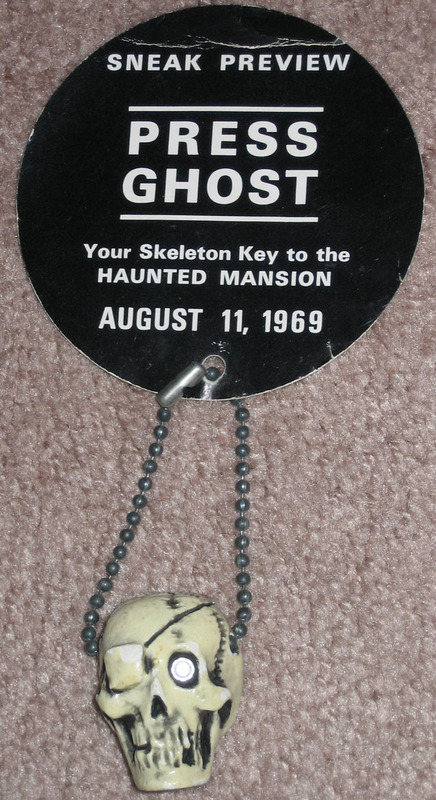 As you can see in the image above, August 11, 1969 was the press preview day at the Haunted Mansion, although it had been open to guests since the 9th. What’s interesting about this piece is the skull trinket / key chain attached to the pass itself. Madog said…The skull attached to the badge was produced By Randotti. These small skull charms and other items were sold in the Disney Land, and later Disney World, as part of the souvenirs for Pirates, Haunted Mansion, Jungle cruise and Old West areas of the Parks. Some of various items Randotti produced are plagues, figurines, tombstones, and skulls, lots and lots of skulls, in all Shapes and sizes. ….that was our (#801A) Pirate Keychain made for the Pirates of the Caribbean in 1967. They glow and came with the keychain and diamond in the eye…sorry but the diamond is fake, lol. Obviously Disney put some of them on a HM pass. I have never seen these before…pretty cool idea. Had they asked, we had skulls without the patch (#822) as well. We sold more of the (#801B) which was the same item but with the neck cord for wearing around your neck. This entry was posted in Disneyland, Gothic Disney and tagged Disneyland, Doombuggies, Haunted Mansion, Jungle Cruise, Pirates of the Caribbean, Stuff From The Park. Bookmark the permalink.